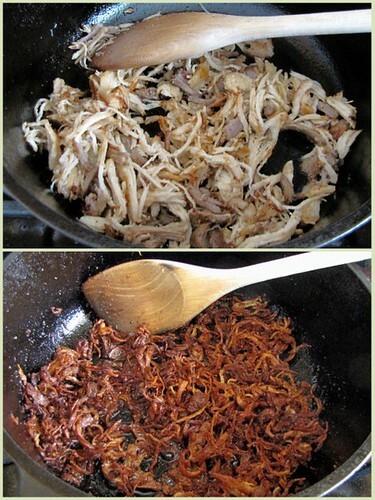 Crispy Flaked Chicken and Pork Adobo ~ I Can Do That! I first read about crispy adobo flakes from the Filipino cookbook MEMORIES OF PHILIPPINE KITCHENS by Amy Besa and Romy Dorotan. As much as I wanted to try it at the time I was deterred by deep frying. That was 4½ years ago. Last week, I discovered the flaked adobo doesn't have to be deep fried. A tablespoon or two of olive oil and a cast iron pan do the job well. I was reheating some left over pork and adobo in a cast iron pot and left it for a few minutes on medium heat. The meat on the bottom of the pot became crunchy. I turned off the heat, let the meat cool down a bit, then I flaked them, returned some to the pot with a tablespoon of olive oil and pan fried, while stirring every 2 minutes until dark brown and crispy. 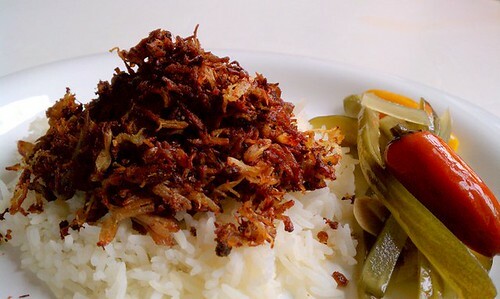 There, crunchy flavorful adobo flakes without the inconvenience of deep frying. Place all ingredients, except olive oil for frying, in a medium nonstick pan and cook until dry, stirring once or twice. [Do not add water.] Remove bay leaf and discard. Let cool and flake meat. Fry small batches in a cast iron skillet on medium heat until golden to dark brown and crunchy. Serve as appetizer, on pandesal, or with rice. That looks great. I have to keep and eye out for that cookbook. I only have one filipino one and it is pretty basic.